The Breville BJE820XL is the flagship juicer from Breville, and is very popular for its power and diversity, delivering excellent results no matter if you're after a finely pulped juice, or a thicker puree or smoothie. Using not one, but two separate discs to take care of different textured fruits and vegetables, it gives users the option of 5 different speed/power settings to really allow for pretty much any task. Are There Any Problems With The BJE820XL Model? The electronic 5 speed dial gives you versatility in your juicing/pureeing needs. No matter if you have lots of leafy green vegetables to get through, where you might need a mid range consistent speed approach, or more dense vegetables to juice like carrots or beets where a higher speed will be required, this juicer has got you covered easily. The good variation in speed along with the high power 1200 watt motor on the Breville BJE820XL give it everything you need to juice and puree no matter what the ingredients are. Along with high power, comes torque, and the ability to not over heat while doing big juicing sessions. This is the true importance of a high wattage engine, so for those of you who plan to really use your juicer a lot, you'll realise quickly just how important this feature is. The Die-cast metal body means durability. 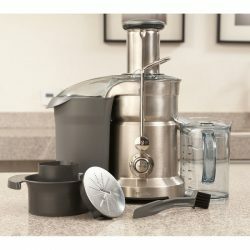 This juicer is certainly not going to break easily, and unless you are actively trying to break it (which would be a tad silly), then it's unlikely that throughout it's lifetime of normal juicing and pureeing that you're going to be able to break any of the parts that make up this model. It's built to last, and this is actually one of the main points of feedback that we noticed many customers would comment on. Not only do you have all that power (the 1200 watt motor) and the speed variance capability to use it in different ways, but with the BJE820XL you also have the ability to tap into that power and speed, and blend a LOT of produce very quickly, due to its large tube input size, which means that you barely even have to touch your fruit and vegetables before putting them straight into be juiced. Obviously if you're juicing something like a watermelon, then this would require some breaking down into smaller sized pieces, but for most of the normal juicing type fruits and vegetables, you'll be ready to rock without doing anything! 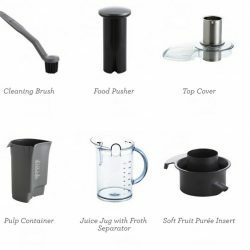 Overall at the time of writing this juicer has a large amount of reviews on Amazon.com already (394 total). Out of those reviews 79% of reviewers gave the BJE820XL a perfect score of 5/5 stars. A further 11% gave it a 4/5 star rating, which is still a very much positive review. 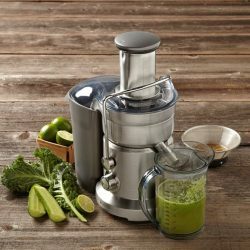 3% of reviewers gave the juicer a 3/5 (average) rating, and the final 7% gave this model a negative review leaving it either 1 or 2/5 stars in total. So overall, this juicer has very positive feedback with nearly all reviewers either absolutely loving it and giving it a perfect score, or giving it a very positive 4/5 stars. Let's have a look at some more specific feedback around this juicer to see what its main strengths are. Firstly, many users have commented that they found this model to be really easy to clean. For anyone who juices regularly, they will understand how important this factor is, and that's why we wanted to mention it first here. So smooth finely brushed steel and plastic surfaces are easy to wash and wipe, which makes cleaning quickly no problem. One customer commented that they're able to clean this easily within just 4 minutes, which is really pretty quick indeed! 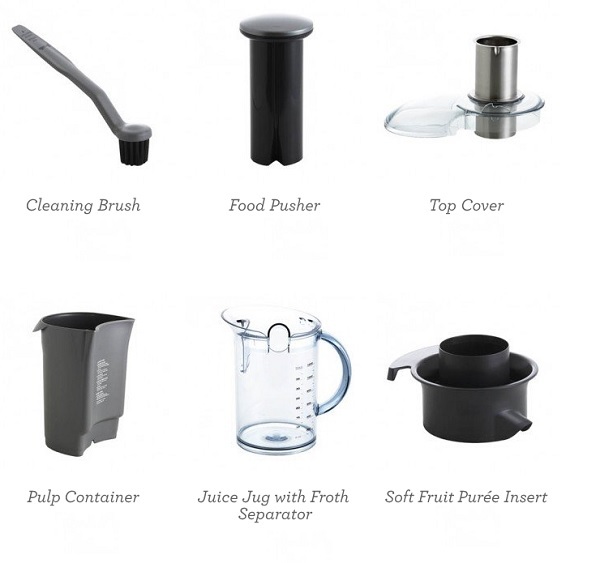 Another big factor that many customers commented on with this juicer is its durable construction. Obviously with some of the lower end juicers and cheaper alternatives, durable construction is not always up to par, but that's certainly not the case here with the BJE820XL Model from Breville, which as you well know, is not a cheap imitation by any means. Users commented that unlike other juicers, this Breville model is made from “unbreakable” plastic (at least when it comes to normal juicer usage it's going to be unbreakable). Apart from those important factors, one of the best things about this juicer, and one of the common comments, is that it's able to really get a great yield out of whatever you put in it. Due to it's dual blade design, it's maximised to get the most out of both harder and softer fruits and vegetables. When it comes to cost saving, and efficiency this is actually quite an important aspect to consider, as over time you will actually be saving yourself a lot of money in produce. 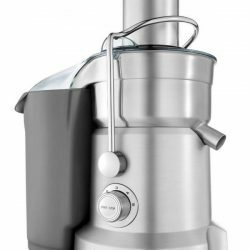 To end this section, it's just worth mentioning that the overall feedback for this model is just that it's a top quality juicer, and people have been very pleased with it as an investment, despite the higher price tag. Although no product is “perfect” and there is almost always something that could be improved upon, honestly, it's not been easy to find any negatives to write about for this model, we had to really dig through the feedback, due to the fact that apart from the unhelpful and nonconstructive negative reviews (almost all products have these from our experience), the constructive criticisms of this product were few and far between, and we had to dig amongst all the good reviews. 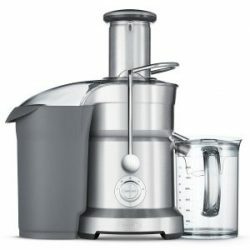 One thing that we noticed a few people comment on that could be perceived as a negative, is the price of the Breville BJE820XL compared with other juicers. Some reviewers despite giving the product 5/5 stars, did comment that they thought it was very expensive, and they believed really the extra cost was largely due to the more high powered engine over other juicer models on the market. However, while this could be perceived as a “negative” it's more just about what kind of juicer you are after in the first place. Some people are simply not going to be able to afford a top of the range model like this, and that's okay. It's not for everyone. Another possible negative here is that when on very high speed (4-5 out of the potential 5 speed settings), this juicer might make some mess when juicing certain harder and very “juicy” types of fruits or veges (for example pineapple, like the customer was juicing). Obviously this can be pretty easily overcome by simply turning the speed down for certain types of fruits/veges. Another thing that a few people commented on that's a bit of a negative, is that this model didn't get enough juice out of the fruits and vegetables, and there was a little too much moisture left over in the waste product. This was only brought up by a handful of the reviews that we read out of dozens and dozens, and many people didn't think this was an issue at all, but obviously it's worth mentioning. Mind you, if you really want to get a juicer that's extremely high efficiency, then you might have to go with a press, and usually you'll have to spend much more money as well. When buying an expensive juicer like this online, or in fact when buying item online (especially higher priced items) you'll want to be sure that you are aware of a couple of important factors when deciding WHERE to purchase your juicer. These 2 factors can make the difference between having a positive and easy shopping experience, or a nightmare shopping experience which will make you question ever buying anything online ever again. Does the seller have excellent online buyer security and shopping cart security? Does the seller have the best possible customer service system available, just in case any problems should arise during or after my online purchase? To help give you a further idea of how the Breville BJE820XL Juicer will look and feel in real life, here's some video footage of this model in action! Here are the common questions that potential buyers often have when considering the Breville BJE820XL Juicer. Hopefully this will help you make up your mind whether or not this juicer is right for you. Where is this juicer made? Like all Breville juicers, this model was designed and engineered in Australia, and then manufactured and assembled in China. Does this model come with a warranty? Yes of course, this model comes with a one year limited product warranty, you can read more about the specifics via this PDF here. The feedback on this model from almost all buyers is that it's extremely sturdy and well made, so it's unlikely that you will have to use the warranty, but it's good that it's included. The BJE820XL has a smooth, and very fine brushed stainless steel surface, which makes it easy to clean, and this is validated by others who've bought the product. How is this juicer when it comes to juicing leafy greens and similar, which are quite often reported as being an issue for other types of juicers? Due to its powerful engine, and 5 variable speeds, the BJE820XL does a great job and is reported to have no issues juicing these kinds of vegetables. What's the main difference between this and the Breville 800 JEXL elite? Is it actually worth the $100 more? This model is more powerful than the 800JEXL, with its higher wattage engine. This will mainly be important to you if you plan to use the juicer quite a lot, and especially if you're planning on regularly juicing more dense fruits and vegetables, things like carrots, beetroots, etc. The more heavy duty engine will really come into play and help your juicer last longer under these circumstances. Where is it possible to get replacement spare parts for this model? It's possible to get them on the Breville website here. Are this model and the Sage BJE820UK the same thing? They seem to look exactly the same, although they are obviously labelled as being different brands. The Sage BJE820UK does have a 1500 watt engine, compared with the 1200 watt of the BJE820XL. What's the yield like from this model? Thought it's difficult to provide any specifics in terms of yield, the reports from other customers concerning the yield of this model are good, and it's reported to perform “as good” if not better than most other juicers in terms of how much juice you're getting out. It's also said to easily handle large amounts of juicing without the engine getting over heated. Is this juicer 110 V or 220 V? It's operating on just 11 volts. Is this a loud juicer? While that's a subjective question, and so difficult to answer easily. Baring in mind that this juicer has a much more highly powered engine than the average cheaper juicer, it's going to be a little louder, yes. 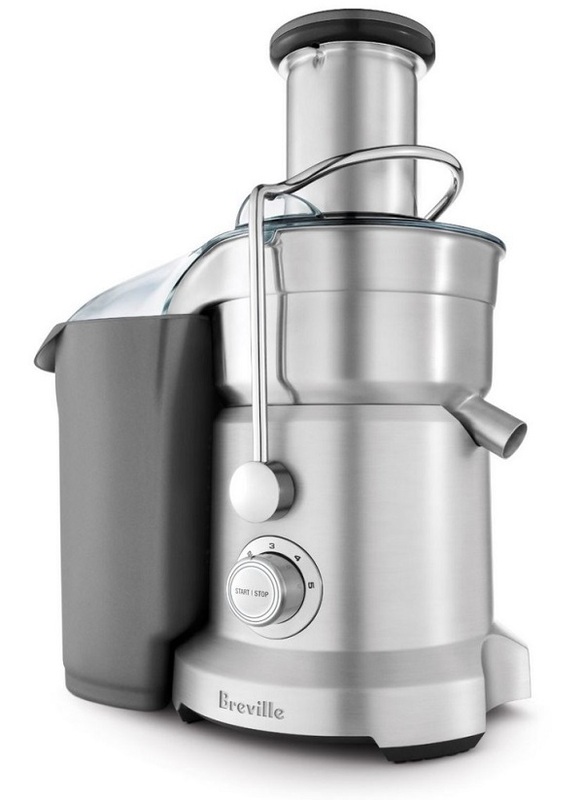 Will this juicer have any problems juicing roots vegetables like Ginger, etc? No, that's the beauty of the powerful 1200 watt engine, it won't over heat or burn out, even on the toughest of product. What about making almond milk, etc? Probably better off to use what's known as a masticating juicer, Breville have a few, such as the BJS600XL Juice Fountain Crush. Is the included pitcher made from glass or plastic? The included one is made from plastic, but it's perfectly fine to buy a replacement glass pitcher if you want to avoid plastic use. How does this do with producing green juices from green, leafy vegetables like spinach, kale, etc? It's reported to do okay, but it won't produce the same yield as if you use a masticating juicer which is much better for that purpose. However, as an overall juicer this will be better and be able to complete a more versatile range or jobs. How well does it juice carrots, and other hard veges? The feedback from many customers seems to suggest that this juicer is great for such items as carrots, beets, etc. How do you avoid the foam when juicing? The foam output is largely due to the speed setting that you are using, if you turn the speed down for most items, and only turn it up when necessary, then you will generally do better. Conclusion – Is The BJE820XL Worth Buying? Overall, it can be said that the BJE820XL is probably one of the best juicers you will find around. 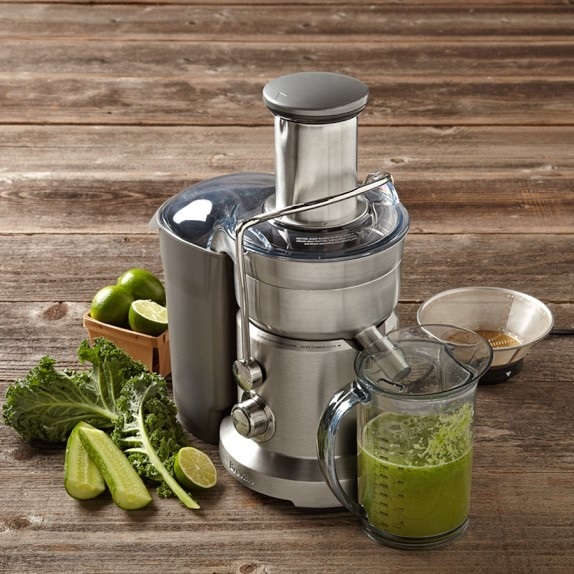 It's high powered engine, and 5 speed variable settings, along with its dual blades make it a mean force to be reckoned with when it comes to creating any juice or smoothie products, along with purees, soups (cold), etc.